Pep up your style quotient by wearing this belt brought to you by Hidesign. It comes with a buckle closure, which will help you to get an adjustable fit. Besides, it has been crafted using good quality material that ensures easy maintenance. The attractive hue also enhances its appeal. 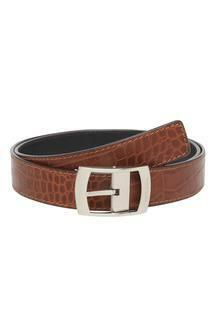 Be a fashion icon by wearing this belt, which has been designed keeping the latest trends in mind. Ideal for any casual occasion, it will go well with a polo t-shirt and a pair of faded jeans.